These 5 free printables will help you get more organized and feel less stressed during this holiday season! I have some little gifts for you today! 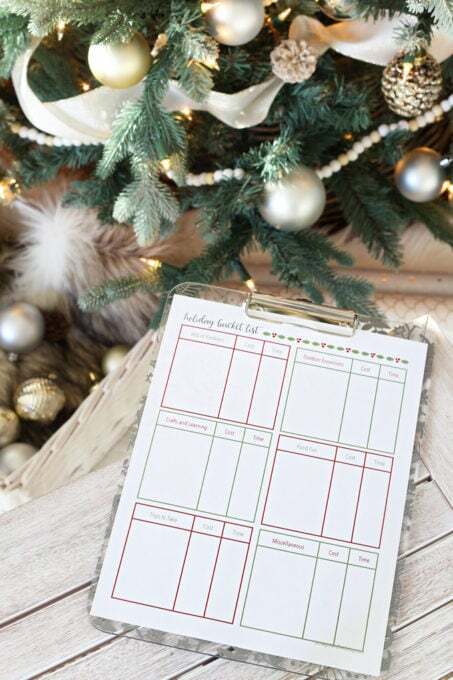 🙂 A few days ago I asked my Facebook and Instagram followers what they struggled with most when it came to getting organized for the holidays, and as I looked over their answers, I felt like so many of the problems they mentioned could be solved with a simple printable! 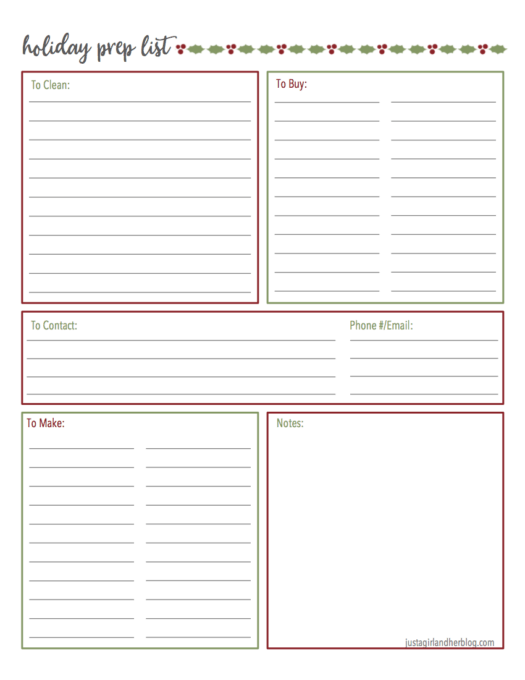 So I decided to create 5 free printables based on the most common struggles people were having with staying organized for the holidays. You can watch the video explanation and/or snag all of the printables below! First, I had a lot of people tell me that they were feeling frantic about gift buying! It can be hard to keep track of who all you need to buy for, what you’re going to get them, and whether or not you’ve purchased and sent the gift if necessary. I created a gift giving printable to help you keep track of all of these details. On the printable, there are columns to list the recipient, gift ideas for each person, the budgeted amount you’re planning to spend, whether or not you’ve purchased the gift, and a spot to write down the date you need to ship the gift if it’s going long distance. If you have more recipients than there are lines on the sheet, you can always print multiple sheets and continue your list on the next page. Click here to download the Gift Giving Guide printable! I also had a bunch of questions about prepping for guests. There are always so many things to do to get ready to host people in your home, so I tried to break it down by category to make it easier. I tried to get the hardest task out of the way first– cleaning! In this section you can list any cleaning tasks you need to complete before your guests arrive: washing sheets, dusting and vacuuming, making sure the guest bathroom is clean and sparkling, etc. The next box gives room to write down anything you may need to buy. If you’re having overnight guests, do you need to pick up some additional towels or toiletry items? You may want to stock up on basics like toilet paper, shampoo, or hand soap so you don’t have to worry about running out and grabbing those things while your guests are there. You could list food items here as well, but I also have separate printables for food that I’ll share in a minute if you’d want to use those instead. There is also space to note anyone you may need to contact. Do you need to contact anyone to make special arrangements for your guests? Maybe you need to order food in advance or rent extra chairs or tables. Maybe you need to contact your guests themselves to ask about food preferences or any needs that they may have while they’re at your house. All of those contacts can be listed in this space. The next box has space to write down anything you want to make– I feel like there are always so many things to make during the holidays! From food to crafts to gifts, you can make a list of everything in this space. And finally, there is room for notes so you can jot down anything extra that comes to mind! 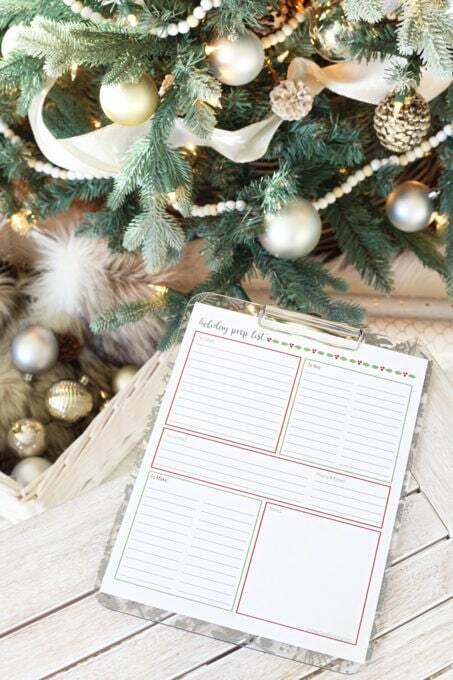 Click here to download the Holiday Prep List printable! Let’s talk about food! One person on Instagram said, “I need help organizing food for our big holiday meal but also for the week when I’m housing guests.” So I have printables for both of those things! 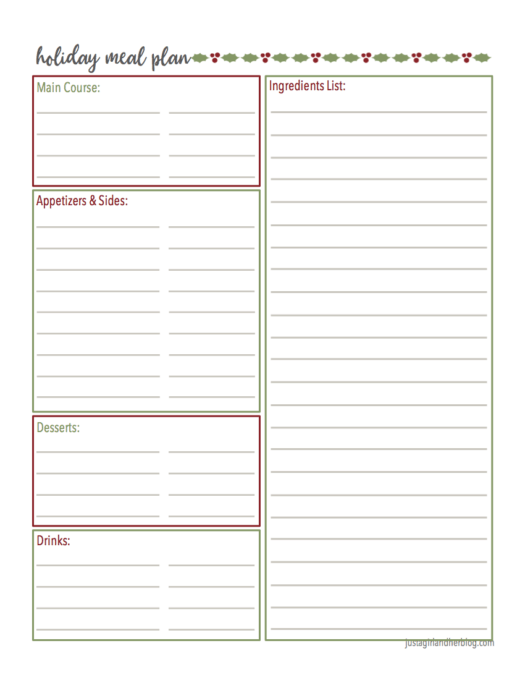 First up, we have a holiday meal planning printable. There is space to write down everything you want to make for the main course, appetizers and sides, desserts, and drinks. Then there is a large section to list all of the ingredients you’ll need. You can take this list to the store with you to make sure you haven’t forgotten any of the items you’ll need, and you can also keep it handy while you’re cooking as a reminder of everything you need to make! Click here to download the Holiday Meal Plan printable! 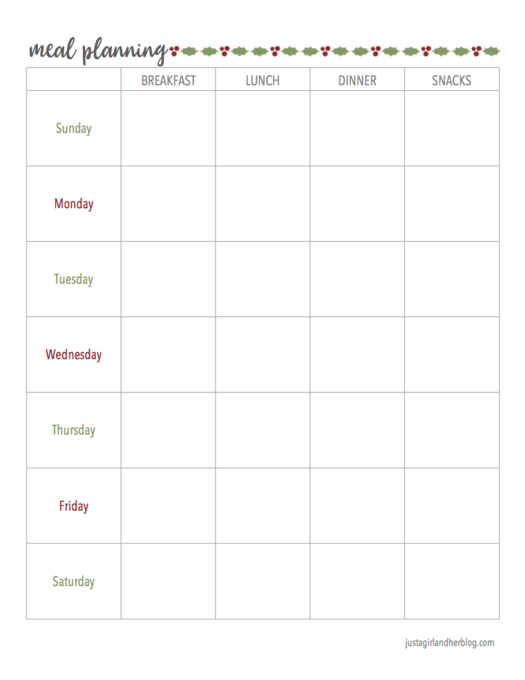 Along with the holiday meal planning printable, I also have a meal planning page where you can plan out everything you want to have available for guests who may be staying for an extended period of time. There’s room for breakfasts, lunches, dinners, and snacks for each day of the week. You could even post this list on the refrigerator so that everyone knows what to expect for meal time (and so they know exactly what they can help with during meal prep 😉 )! Click here to download the Meal Planning printable! Finally, I received a bunch of questions from people about organizing FUN! With the kids home for the holidays, there are often traditions you want to uphold, activities you want to do, maybe even trips you want to take… and you can keep track of it all on this page! Again, I have it broken down into categories… acts of kindness, outdoor excursions, crafts and learning, food fun, trips to take, and a “miscellaneous” category as a catch-all. There is a column to note the cost of each activity and also how much time it will take so you can have all of the info you need to plan your activities. As fun as it is to do allllll the things during the holidays and pack this list full to the brim, I try to prioritize and keep it simple so we can really focus on the few things that are important to us and enjoy the holidays and the extra family time, rather than running ourselves ragged trying to squeeze in every single activity. 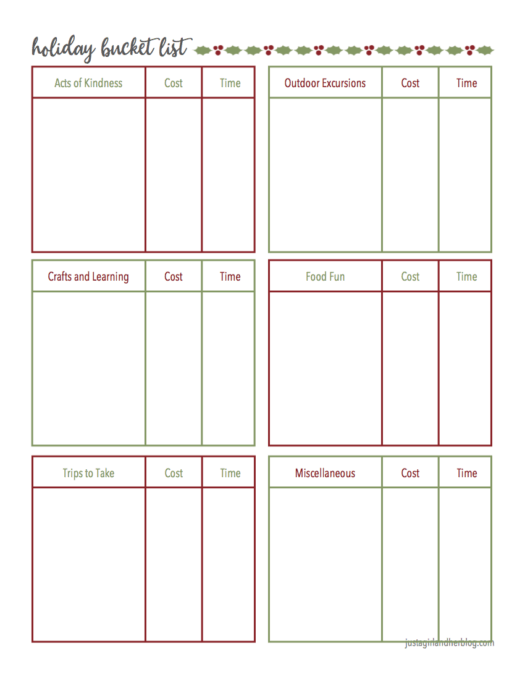 Hopefully this printable can help you get organized and be intentional about the things that are most important to you this season. 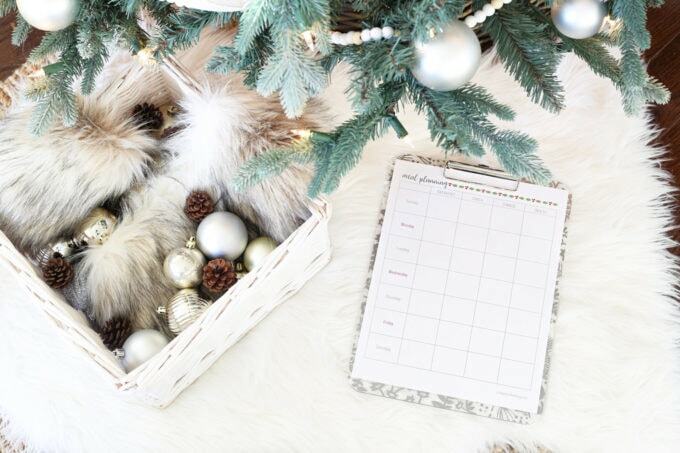 Click here to download the Holiday Bucket List printable! So those are my 5 little freebies for you! 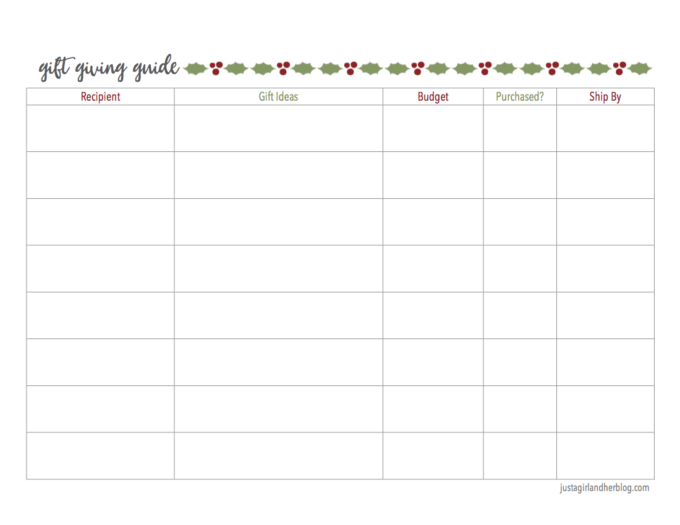 I hope that these printables will help make this year your most organized, relaxing holiday season yet! Enjoy your time with family and friends this week! They are awesome!!! Thank You!!! Wow! Thank you so much for these! They are perfect and beautiful! These are so cute – thanks Abby! So glad you like them, Alix! Have a great week! Oh I love the bucket list printable! Thanks Abby! Thanks for these. They are awesome! And Happy Thanksgiving to you and Donnie — and the boys! So glad they’ll be helpful! Hope you had a great Thanksgiving! Love how you are so straight forward in both your writing and your videos. Clear and concise – you are awesome ! Excellent printables, Abby. I love the bucket list the most! I’m going to plan Christmas more intentionally this year before I get plowed under by the “have-to” list. Thanks so much for sharing another helpful idea! Thank you, Abby! Love following you. You’re too sweet! Thank you, Jenica! Have a wonderful week! Love this, especially the Holiday Bucket List! For our family, making wishes and making plans don’t always go hand-in-hand so I love having a place to jot down notes when inspiration hits. The best thing is that Acts of Kindness are listed first – what a great way to remember the reason for the season and include it as a “wish” on this list! Thanks Abby, and happy holidays! These printables are awesome! Thank you for creating them and gifting to us! So glad they’ll be helpful for you, Jen! Have a wonderful holiday season! These are perfect! I was looking for a way to stay organized and sane 🙂 Thank you! 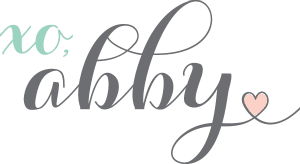 love your FB page and blog! I wanted the recipe printable. I cant seem to find?